The Senate majority leader hails from Spokane on the east side of the Cascades. The two deputy leaders are women of color from distinctly different cultures and backgrounds. 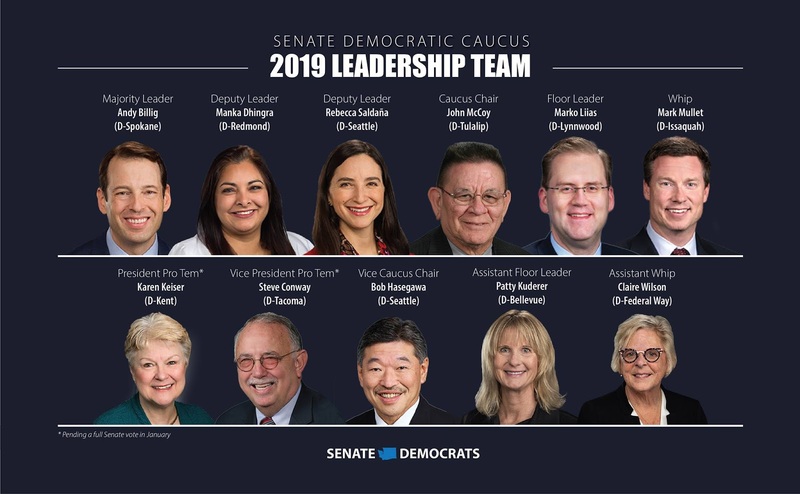 The caucus chair is a Tulalip Tribe member who has long served as the Legislature’s leading authority on tribal issues. Similarly, the caucus chair needs no primer on tribal issues. Sen. John McCoy (D-Tulalip) has been the Legislature’s foremost arbiter of tribal concerns since he was first elected to the House of Representatives in 2003. One of the two deputy leaders, Sen. Rebecca Saldaña (D-Seattle), is a former labor organizer who worked with farmworkers in eastern Washington. The other, Sen. Manka Dhingra (D-Redmond), is a prosecutor who has led community-wide efforts to prevent domestic violence in King County. Both broke barriers upon entering the Senate: Saldana became the only Latina in the chamber, while Dhingra became the first Sikh woman ever elected to a state legislature. Both say they understand intuitively whether aspects of state laws meet or fail the unique needs of Washingtonians of color. In addition to serving as deputy leader, Saldaña will serve as vice chair of the Senate Transportation Committee and serve on Labor and Commerce as well as the new Housing Committee. In addition to her leadership duties, Dhingra chairs the Senate’s new Behavioral Health Subcommittee. She will also serve as vice chair of Law and Justice and serve on the Health and Long Term Care Committee. In addition to his leadership post, McCoy will serve as vice chair of the Environment and Tourism Committee. He will also serve on Early Learning and K-12 as well as on Agriculture, Water, Natural Resources and Parks.